Bezel Set Stones Contain the Best of Both Worlds, Enjoy the Brilliance and Sparkle of a Diamond in a Very Secure Setting While Wearing a Design With a Modern Twist. 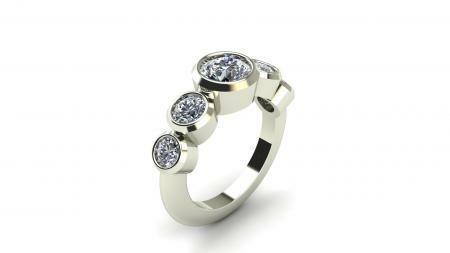 1.00 Carat Total Weight of Four Round Brilliant Diamonds Enhance the Brilliance of the Center Stone. This Ring Looks Spectacular in Any Color Gold Including Two-Tone!